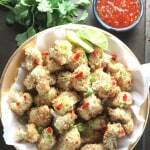 Salt and Pepper Cauliflower Bites; a healthy take on a classic chinese dish! Preheat the oven to 200c / 400f. Line a baking tray with greaseproof paper and lightly grease with oil or butter. Cut the cauliflower into florets. The size is up to you, just remember if they are very large or very small this will affect the cooking time. Using a food processer, blitz the bread until it reaches a small crumb consistency. Add the chinese five spice, garlic powder and salt and pepper to taste and blitz again until it has all combined. Transfer the breadcrumbs onto a large plate. Spread the flour out on to another large plate and crack the eggs into a bowl and beat with a fork. Next make a little assembly line on your kitchen counter. Each of the cauliflower florets need to be rolled in flour, dipped in egg, coated in breadcrumbs and placed onto the baking dish. Once all the cauliflower florets have been rolled, dipped and coated, bake them in the oven for 12-15 minutes or until they have cooked through and are nicely browned on the outside. If you don’t have a food processor, or any bread to hand, it’s ok to use dried breadcrumbs instead.